There was a song my grandparents loved called, “I’ll give you a daisy a day.” (By Jud Strunk) It is about a husband and wife who enjoyed life, love and one another. It is a beautiful tribute to romantic love. In the song, the husband brings the wife a daisy a day – even after she passes on. After my grandfather first heard this song he began to bring my grandmother daisies every day. 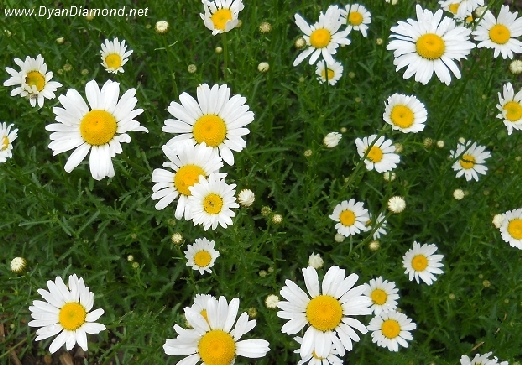 Years later, when he became ill, he brought some wild daisies from their farm and planted them in their yard. He wanted her to always have daisies, even after he was gone. They had a beautiful relationship. They left nothing unsaid. A friend of mine lost her best friend very recently. It was sudden and tragic. She was comforted by the fact that they had said everything to one another, they never held anything in. They gave each other daisies every day. Never leave love unspoken. Be sure to give everyone you love a daisy a day. You never know how important a little daisy, a little love, can be. PS: The photograph is the actual daisies my grandfather brought from the farm. They still grow in their yard. I will give out a daisy today! Thank you for this special message. “Never leave love unspoken.” Perfect. Didn’t know the forum rules allowed such brnalilit posts. This is SUCH a special blog to me!! Barry and I had this kind of relationship, although he never literally brought me flowers! When he passed away so suddenly it was such a blessing for me to know that we, too, had also not left anything unsaid. Thank you so very much, Dyan! !